Inspired by my friend who is attempting to cook his way through "Joy of Cooking" from begining to end, I thought I might try the same with a cocktail book and try to gain a larger perspective on the world of cocktails. Rob's already working on the "Mixer's Manual" so I thought I might try Craddock's "The Savoy Cocktail Book". I'll try to make as many as I reasonably can with what ingredients are currently available and post pictures. If you want to help, let me know. My liver will thank you. I will work on my velvet light box, I promise. First up is "The Abbey". I really like the translucent orange color of the cocktail. It almost seems to glow from within. Flavor is light, orangey and a little bit bitter. Like other Lillet based cocktails I've had in the past, I don't seem to notice that I'm drinking spirits. Something about Lillet seems to transform gin into spring water. Could be dangerous. Is "Valencia" a good answer? 1/4 of a valencia orange, handily enough, seems to give about 3/4 ounce of juice. I just chopped it in half and then quarters and squeezed it in to the measuring cup. I'm a bit worried about the letter A, since I don't have real absinthe, and am not sure about Alexanders or any of those awful sounding "After Dinner" or "Angel Wings" cocktails. Next up, various Absinthe cocktails murdered with Henri Bardouin Pastis. 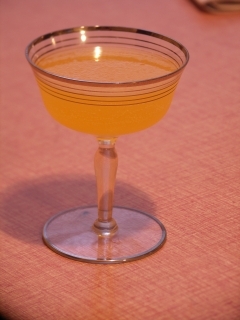 The next cocktails are Absinthe based, and my plan was to make them with Henri Bardouin Pastis. As much as I like Bardouin Pastis, Absinthe cocktails made with it, aren't doing it for me. When you chill Bardouin Pastis down to proper cocktail temp, before I can get a photo, some of the essential oils precipitate out in a most unattractive manner. I suspect I am going to have to break down and get a more accurate Absinthe substitute. The two most available are La Muse Verte pastis and Absente. Any advice on which to choose? Why not just get some absinthe? This is probably a stupid question, but I'm assuming Lillet blanc (as opposed to rouge)? The recipe doesn't specify. I think in "Vintage Cocktails..." or some other source, I read that Lillet was initially only blanc and Dubonnet only rouge. They later introduced products to compete with each other; but, unless a recipe specifies you should assume that Lillet is blanc and Dubonnet rouge. Well, I suppose. I would like to try the Jade products. Hard to spend that ~$100 on faith that you will like them, though. I think in "Vintage Cocktails..." or some other source, I read that Lillet was initially only blanc and Dubonnet only rouge. They later introduced products to compete with each other; but, unless a recipe specifies you should assume that Lillet is blanc and Dubonnet rouge. That's REALLY interesting and useful. Thanks. In re absinthe -- that's true, of course. But on the other hand, it beats agonizing over finding a good substitute. Here's a quote re: Lillet from the recipe for the Corpse Reviver #2 from "Vintage Spirits...", "...Lillet. Like Dubonnet, it has two varieties, red and white. One always chooses red Dubonnet, conversely, always choose Lillet Blanc." I can't recall where I read the about the two companies introducing the other varieties to compete with each other. what about Neveau Orleans? Reverse engineered using pre-ban absinthe and "original" equipment. This will be fun! We haven't attempted this is such a logical manner. We do try to make one new cocktail each week to keep things interesting. Keep up the good work. You are a brave man to take on such a challenge, particularly when you know there will be drinks to be made that you would otherwise never attempt. I'm looking forward to your posts. They still sell real absinthe in the Czech Republic, so if you know anyone who's going there, ask them to bring you back a bottle. Or (and this is really obscure, but what the heck), if you know any chemists ... some time ago, Scientific American published the original recipe for absinthe. I know someone who actually made it from that. As I recall, it's made from distilled spirits, anise seed and wormwood. Anyway, it can be gotten - just depends on the lengths to which you're willing to go! Well, I'll "put a bookmark" in the 3 Absinthe cocktails for the time being. Shake well with ice and strain into a medium size glass and fill with soda water. Squeeze orange peel on top. Made with Boissiere dry & Noilly sweet it is an OK but not very exciting drink. I wouldn't turn it down, but, can't imagine I would ever order it. However, with Vya dry and Noilly sweet it is quite a bit more tasty. I bet it would be even more interesting with Vya sweet or Carpano Antica instead of the Noilly. Seems to me like a watching tennis on a hot summer afternoon with Muffy and Biff while Jeeves makes cucumber sandwiches kind of beverage. I know these as Half and Halfs or Red and Whites when they are on the rocks with a twist of lemon or orange. I make mine with Noilly dry (I'm a die-hard Noilly dry fan, but don't like their sweet stuff) and either Vya sweet or Antica. I didn't care for the Vya dry at all, but that's because I have a low tolerance for cinnamon, which I taste too much of in Vya dry. It's a nice aperitif during summer, right before a meal. Or a digestif, I suppose, but it needs to still be hot and light outside. Trillium, I was thinking ice might be nice (and maybe some whiskey)! PS. Small bonus at work this week due to my, "exceptional commitment to customer service," has resulted in the reception of an email with the following subject, "Liqueurs de France Ltd : Order shipped". edit - oops, wrong cocktail name. 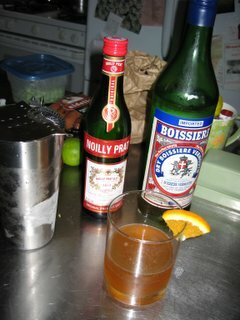 Whew, finally finished that Noilly sweet vermouth last night and have switched to actual Italian vermouth. As far as the Adonis goes, I have to admit I've never really acquired a taste for dry sherry of any sort, so this drink puzzles me. It's not through lack of trying. I mean, practically since reading Poe's, "A Cask of Amontillado," in grade school, I have been buying bottles of dry sherry hoping to get it. Then I taste them and realize, I just don't get it. Possibly I need to travel to Spain some time. Oh, and I realize now I shook this cocktail when the instructions clearly stated it was to be stirred. I did think this drink would be a lot nicer with a nice thick lemon peel twisted over it. It looks icy cold and I actually like the little bits of ice that you get from a well shaken drink. You're using Gary Regan's bitters and Gary always says "There are no rules!". So shake away. I have some dry sherry, nothing very good, so maybe I'll give it a try. 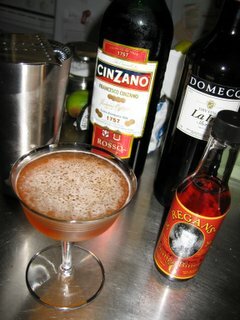 Do you think adding a bit more bitters would have helped this drink or is it just overwhelmed by the dry sherry. I was generous with the "dash" of orange bitters, thinking the same thing, taking them to the edge of detectability. Didn't hurt. I think the oils from a nice thick piece of lemon peel would do a lot more to give the Adonis a little snap and play nicely with the sour aspect of dry sherry. Stir well and strain into a cocktail glass. Squeeze lemon peel on top. I did remember to stir this one to chill, and a fine, fine cocktail it is. I'm not normally a big scotch guy, but, here it is quite nice. With the vermouth and bitters both tempering and accenting the briny and savory notes of the whisky. Following this with interest, Erik. I haven't been very eager to incorporate scotch into cocktails either, preferring it neat, but that looks like an interesting drink. Well, you could take me to task for using a too nice whisky (Compass Box's Asyla) in this cocktail. But, I'm more of a bourbon and/or rye drinker and, strangely, I don't even have any friends or aquaintances who are scotch drinkers, so this is the only token Scotch in my bar. At least it's a blend and not over expensive. It's a fairly mellow whisky, though, at least by Scotch standards. Well, you could take me to task for using a too nice whisky (Compass Box's Asyla) in this cocktail. Want to know something crazy? That's the well scotch at Pegu Club now. Actually a very good one to use for cocktails. You don't want something to terribly assertive or smokey. 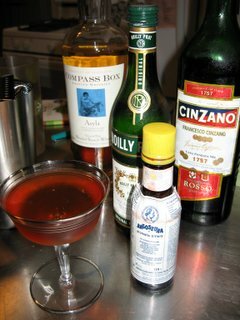 are we, essentially, looking at a perfect Scotch Manhattan w/ increased vermouth? or am I missing some thing? Some might say a Perfect Rob Roy. Although my guess is that the proportions of the vermouths to the Scotch really would make this an entirely different drink. I love Scotch -- it used to be my drink of choice before I discovered cocktails. But I hardly ever drink it these days, because I find it doesn't lend itself to cocktails. Nice to hear of a drink that uses it successfully.